When greenhouse gases (GHG) such as methane, carbon dioxide and nitrous oxide are released into the earth’s atmosphere, they trap infrared radiation from sunlight. This is stored as heat in the atmosphere and can be tied to the increase in the earth’s average temperature, causing what is known as global warming or climate change. Energy-from-Waste offsets greenhouse gases to combat climate change. According to the U.S. Environmental Protection Agency (EPA), for every ton of municipal solid waste processed at an Energy-from-Waste (EfW – also known as waste-to-energy) facility, the release of approximately one ton of carbon dioxide equivalent emissions into the atmosphere is prevented due to the avoidance of methane generation at landfills, the offset of greenhouse gases from fossil fuel electrical production , and the recovery of metals. FACT: Methane is a greenhouse gas, mostly emitted from decomposing waste in landfills in the United States, which is more than 20 times the potency of carbon dioxide and is ranked as a dangerous contributor to climate change. Each ton of waste processed via energy-from-waste eliminates the need to consume approximately one barrel of oil of one-quarter ton of coal, in order to generate the equivalent amount of electricity. Municipal solid waste produced from municipalities is sorted into recyclable and non-recyclable feedstock. The non-recyclable MSW is processed via our gasification technology to generate renewable energy (electricity and Methanol, Urea, or UAN). The syngas is produced from 1,000 ton/ day MSW gasifier feeding pure Oxygen. 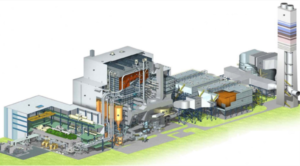 Gasification plant system uses updraft gasifier of G-TEC design, followed by cyclone, heat exchanging boiler, venturi scrubber for clean syngas, and gas holder. The 12 ton/ hr corresponding steam from 1st heat exchanging boiler and 20 ton/ hr of 2nd heat exchanger is used for heating source in Methanol process, waste drying and waste water treatment. The syngas produced from the single 1,000 ton/ day gasifier is converted into Methanol production of 165,000 ton/ year. Principal process of Methanol production includes Methane reformer, compressor, Methanol reactor and distillation tower. Best Available Control Technologies (BACT) are implemented, resulting in industry leading emission controls.